I missed the pyrex sale two weeks ago (baby had a fever). Did you go? Did you buy anything? I found my first pyrex stand at Salvation army...the dish is lidless, but I will still give it a good home! Do you know what this pattern is called? 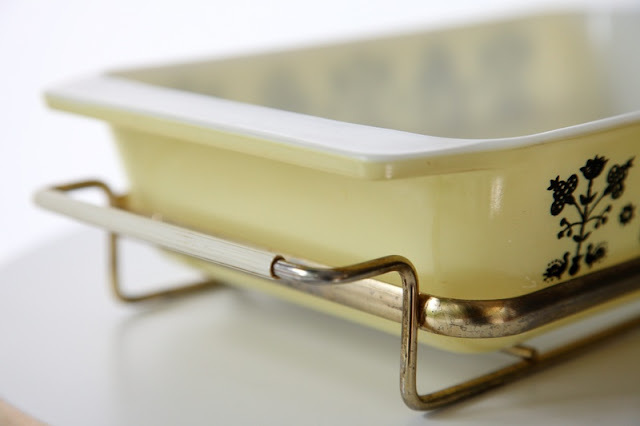 The pyrex is absolutely lovely. I'd never seen casseroles in a stand like that. Looks useful! And I love that little vase. So cute! I LOVE the black and cream - that is so adorable. 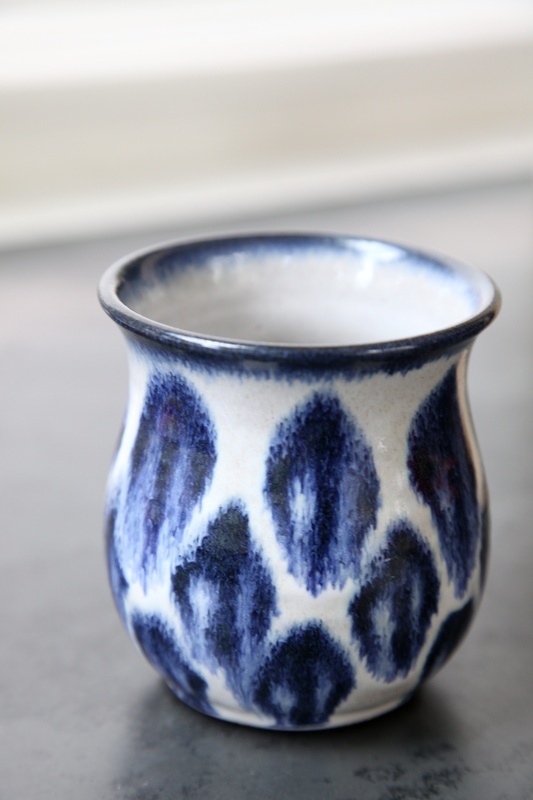 ..and the blue vase is almost an ikat design - very au courant!! I missed the pyrex sale as we were away, but I was lusting to go! You always have such great finds! Woo. Good thing I didn't know about that sale, otherwise I would've been mightily tempted to splurge and I already picked up two more bowls (that I shouldn't have) last week! 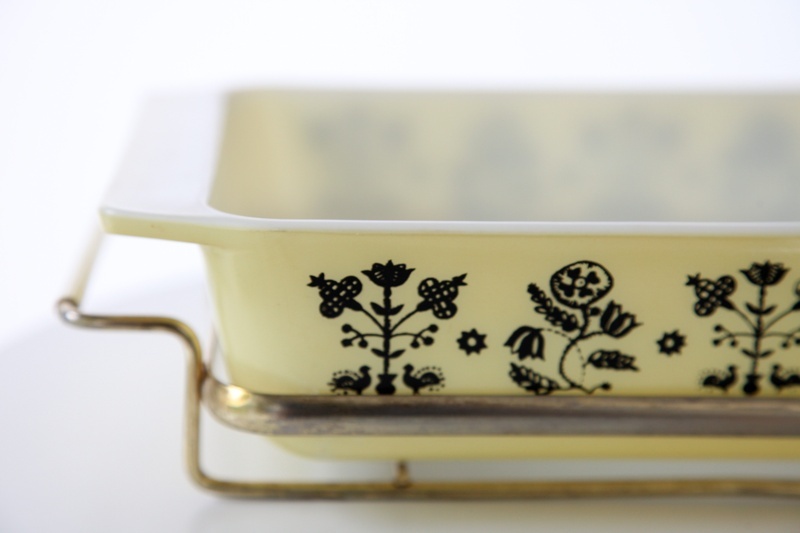 The pyrex pattern is called embroidery. The dish is called a spacesaver. black and cream is the best! You got me loving Pyrex!! Love all the different colors it comes in. I just started a collection of Pyrex a month ago. Well, maybe it's not a collection yet since I only have 2 pieces but I"m loving it. I adore your cream and black piece!! Careful! Once you start! you just can't stop!!!! Thanks! I love it! I should check ebay for a clear lid! I don't know what I would have been tempted to buy!!! I hope they had a good turnout at the sale! I REALLY wanted to go too! I think I have a spot for the vase...well, I have to diy a little project first...then I have a spot! Ahahahaha omg can you imagine? !